There has been much written and even more said about the icons in Apple's new iOS 7. Flat when compared to the icons in iOS 6, the icons dump depth for simplicity, and rather than textured backgrounds, they have either a monochrome or a gradient background. 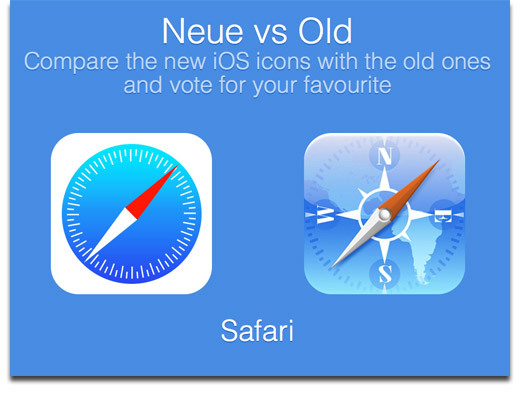 Of course, all that could change by the time Apple releases iOS 7, but someone has launched a site that will let you compare the major Apple icons and vote on which one you like best. It's cleverly called Neue vs. Old, a play on iOS 7's use of Helvetica Neue as the system font. To start, just click on the icon you like best and you'll be taken to the next set. At the end you can see the results. Pretty cool!